Baba Yaga has more of Rise of the Tomb Raiders fun platforming and gorgeous Siberian cliffsides, but the condensed format only strengthens its problems. I couldn’t get on board with Rise of the Tomb Raider’s eye-rolling B-movie melodrama and simple puzzle design, even though I enjoyed leaping around the icy Siberian landscape and spelunking the occasional tomb. 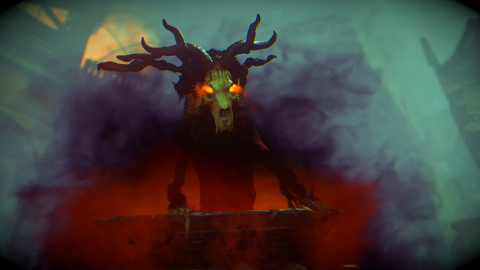 So, posited as a short bit of story DLC, Baba Yaga: The Temple of the Witch needs to do some impressive work to distract from the awkward dialogue and weak characters from the the main campaign. And in that respect, it fails. There’s nothing to learn about Lara we didn’t already know. But in (almost) completely ignoring the main protagonist as anything other than a walking, talking, bow-and-arrow, The Temple of the Witch—like the primary campaign—manages to be a decent place to shoot arrows and climb around while ogling the intricate vistas. But I already did plenty of that in the main game, and there’s nothing substantially new introduced in the DLC. It’s just a $10 ticket to romp around a much smaller bouncy castle, crowded by a handful of sad, strange-looking Siberians with perfect English accents. And they won’t bounce with you. The DLC is structured like the rest of the game: a few puzzles, some climbing, a bit of reminiscing about Lara’s Very Dead Dad—this time though, some of it is presented through the lens of psychedelia. Early on, Lara meets a young woman looking for their lost grandfather. He set out to find the Baba Yaga, a witch ripped straight from the popular folk tale who apparently A) exists and B) murdered grandpa’s wife way back when. And since everyone in the Tomb Raider universe is driven by blind, burning vindication, grandfather abandons his living family to do some good ol’ fashioned revenge killing. Lara enters the Baba Yaga’s turf in pursuit of the old feller, and is immediately dosed by some potent fiction flower pollen. The stuff sends her tripping, warping the world and creatures around her into a saturated hellscape, where every skull has glowing eyes and drips with black ooze—the kind of nightmare drug realm I imagined the slightest inhalation of second hand joint smoke might banish me to in my peak D.A.R.E. years. It’s a pretty hokey visual palette that, while interesting to look at, doesn’t serve as a meaningful playground for storytelling. Despite a few intriguing bits of epistolary narrative doled out in found recorders and journal entries, the story is predictable and safe. I picked up on the grand revelation immediately, and even if intentional, the supporting characters and their reactions were too undercooked for me to care. Grandpa is an old guy and his granddaughter is a concerned young adult. They care about each other. Family good! Witch bad. ‘Yes, family is good and also my father is dead,’ thinks Lara. That’s about where the character development starts and ends. After getting chased by a witch house with chicken legs, the questline sends Lara back to an open area from the main game to shoot some deer and harvest a few cave flowers to make a psychedelic anti-drug. Had I been sent back to do something new in an old arena, I wouldn’t be peeved. It’s a semi-open world with a decent variety of systems to play with. But to just go back and do something I already did in the same area was a huge disappointment. Platforming puzzles nearly save the day. A few asked me to pore over the logic of the scene, an assemblage of all the best things about the Tomb Raider series’ best puzzles: the interlocking mechanics of Lara’s tools, the gears and cogs and platforms that require study and experimentation. But Rise of the Tomb Raider wouldn’t trust me with a plastic spoon and an open jar of peanut butter, and that’s still true here. The moment I got stumped on a particular piece of a puzzle scene, Lara would speak a quizzical line aloud to herself that gave away the next step. ‘I wonder if I need to use rope to anchor those platforms somehow.’ Then do it yourself, Lara. Damn. The Temple of the Witch is a condensed version of Rise of the Tomb Raider’s biggest problems. The Temple of the Witch is a condensed version of Rise of the Tomb Raider’s biggest problems. It’s more Rise of the Tomb Raider, an enjoyable game even despite the shallow story and how it insists on trying to play itself. It looks spectacular, the jumping feels good, and the DLC is both good-looking and full of platforming, but the key difference in this DLC is that there’s a house with chicken legs and a few fiery skull dogs after Lara. The Temple of the Witch promises an interesting premise but ends up feeling like a serving of lukewarm leftovers from last night’s meal, and while tasty the first time, Rise of the Tomb Raider doesn’t reheat well.